Cinnamon is one of the oldest spices known to man in the world. The benefits of cinnamon have been documents from as early as 2700 B.C. on the continents of Asia, Europe, and Africa. There are two types of cinnamon: Ceylon and Cassia which is Chinese. Cinnamon has many health benefits ranging from anti-clotting to brain boosting functions. In 2003, a study published in Diabetes Care studied people with type two diabetes and the effects that cinnamon had on their blood sugar levels. It was found that 60% of the participants who had type two diabetes and were given daily doses of cinnamon saw a 18-29% decrease in fasting blood sugar, a 23-30% decrease in triglycerides, a 7-27% decrease in LDL cholesterol and a 12-26% decrease in total cholesterol (Wong). It is believed that cinnamon helps to control rises in blood sugar levels after meals because it slows the rate at which the stomach empties after a meal. It is also thought that cinnamon can help patients with type two diabetes by improving the ability of the cells to respond to insulin. This occurs because of insulin’s ability to stimulate insulin receptors (Turcotte). Additionally cinnamon inactivates an enzyme that is responsible for activating insulin receptors which forces the body to use glucose more effectively. Cinnamaldhyde is a compound found in cinnamon oil that works to prevent harmful blood platelet clotting which in turn ensures that there is proper circulation thought out the body. This process occurs due to the release of arachidonic acid which is found in the cell membrane. 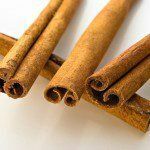 Due to this fact, cinnamon is very beneficial for any condition that involves inflammation (Turcotte). Cinnamon also has an anti-microbial property which helps to stop the growth of harmful bacteria and fungi (Turcotte). The most common bacterial infection that cinnamon prevents and treats are yeast infections. The anti-bacterial properties of cinnamon also allow it for an excellent food preservative. Additional studies suggest that cinnamon may be able to help relieve constipation and decrease the risk of cancer. Cinnamon contains manganese, dietary fiber, iron and calcium. Calcium and fiber in combination help to remove bile salts from the body by binding to them (Turcotte). Bile salts can damage the colon cells and lead to colon cancer so eliminating them helps to reduce the risk of developing colon cancer. Since cinnamon contains high levels of fiber, it can also provide relief from constipation and the pain associated with it. As with all natural remedies, cinnamon must be taken in moderation. Some side effects that can occur when consuming cinnamon include skin and stomach irritation, uterine contractions, blood thinning, kidney and liver problems (Griffin). Those on insulin and antibiotics should talk to their health care professional before consuming insulin. “10 Health Benefits of Cinnamon.” .Eat This, 23/03/2006. Web. 25 Jun 2012. Griffin, R.Morgan. “Cinnamon.” WebMd, 29/11/2010. Web. 25 Jun 2012. “Side Effects of Cinnamon.” Eat This, 27/09/2011. Web. 25 Jun 2012. Turcotte, Michele. “Cinnamon Health Benefits.”. Livestrong, 11/03/2011. Web. 25 Jun 2012. Wong, Cathy. “Benefits of Cinnamon.” About.com, 25/09/2011. Web. 25 Jun 2012.